The first renderings up for a new residential project at 8-16 Nevins Street in Downtown Brooklyn, which Bushburg Properties is developing; the reveal comes from the building’s architect, the Stephen B. Jacobs Group, which posted the renderings to the firm’s website. The Real Deal first reported on Bushburg’s acquisition last September, when the two lots that comprise the site were bought for $16.3 million. While no permits have been filed, the existing structures are apparently occupied by tenants with short-term leases, and demolition will be simple. Despite the lack of DOB filings, The SBJ Group’s page on the development gives all the necessary details, and indicates the tower will total 135,000 gross square feet, split between 136 apartments, in addition to ground-floor retail. 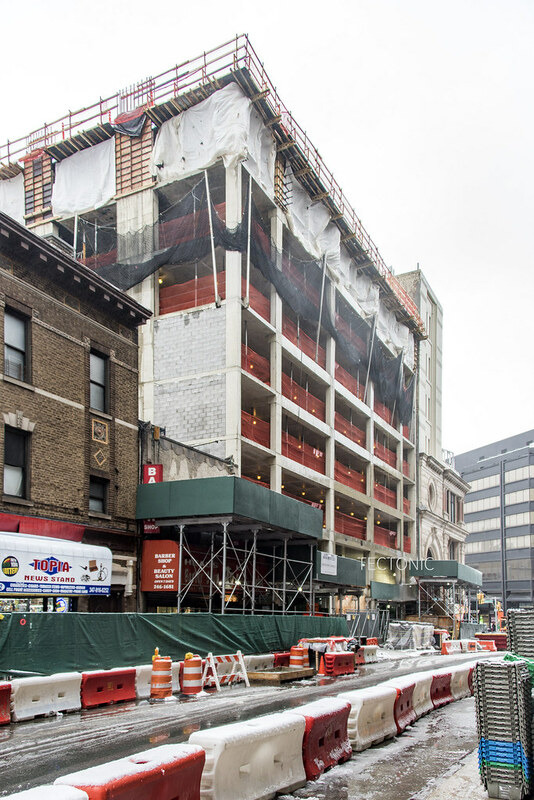 Bushburg’s high-rise will also include an affordable component, allowing the developer to build beyond the lot’s potential under current zoning, which would otherwise limit its scope to 90,000 square feet. SBJ has a great track record, and the firm has a slew of projects currently in the works across the New York City region; their work on Glenwood’s towers that are rising as part of the Fordham redevelopment prove the firm’s versatility, as those buildings are relatively classical cousins to the decidedly contemporary scheme for 8-16 Nevins Street. Brooklyn’s skyline is lacking in nighttime icons, and 8-16 Nevins Street will further enhance the developing Downtown area; the LED lighting atop the tower will be similar to the scheme that was recently deployed at 388 Bridge Street, and hopefully more of the new high-rises will employ dazzling visuals. While some may consider the LEDs to be gimmick-y, their presence will distinguish the DoBro skyline from its comparatively boring counterparts in Long Island City and New Jersey. No completion date has been announced, but given the recent acquisition of the site, construction appears to be imminent. Demolition will happen soon to make room for the tower. Three storefronts at 8-16 Nevins Street in Downtown Brooklyn will meet the wrecking ball to make way for a 28-story tower with a cutout and LED lights. Demolition applications were filed last week to knock down the three two- and three-story buildings at 8, 12 and 14 Nevins. Developer Bushburg Properties is building the 124,287-square-foot building, which will house 149 apartments, as well as some affordable units, as we reported earlier. Amenities will include a rooftop lounge, a gym, and a mesh-clad metal bulkhead that will light up with LEDs at night. The 318-foot-tall highrise will also have 6,440 square feet of ground floor retail. 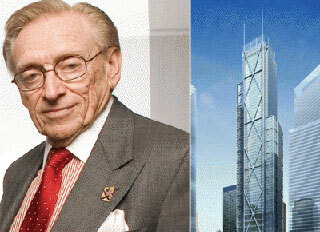 Architects Stephen B Jacobs Group are designing the project. Bushburg snagged the properties between Fulton and Livingston last September for $16,690,050, according to public records. While downtown Brooklyn has seen a number of towers rise over the years since its 2004 rezoning, the process has been slower on the eastern edge of Livingston Street, near Atlantic Terminal. The zoning is very liberal – the C6-4 district that covers Livingston allows the highest residential densities in the city – but first the small walk-ups on 20-foot-wide lots need to be assembled into larger parcels, which can be a slow process, especially when they have rent-stabilized tenants who need to be bought out. 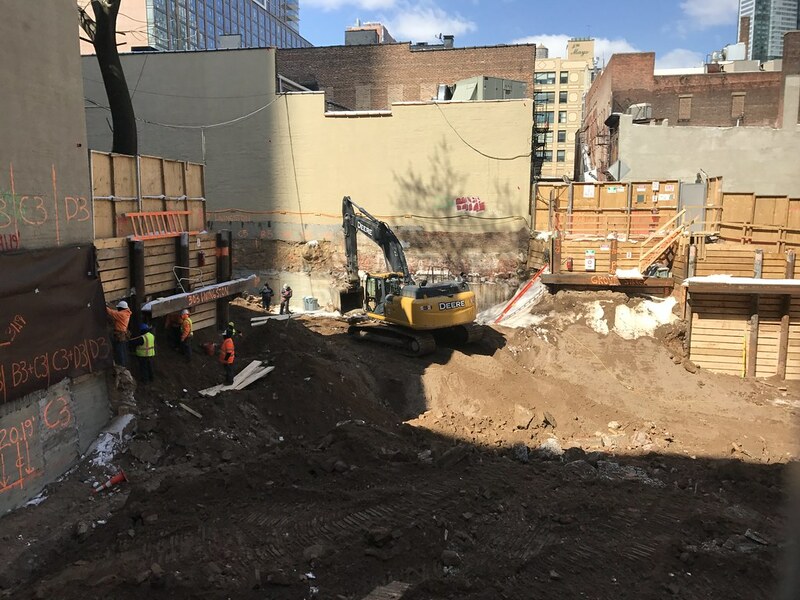 But at 299 Livingston Street, on the north side of the street between Nevins and Hanover Place, one developer may have done so (or be on their way), as permits were filed this morning for a 17-story apartment building on a 43-foot-wide piece of land. 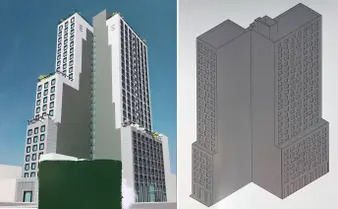 The application for a new building, filed by the architects at the Stephen B. Jacobs Group, calls for a 37-unit tower divided among 37,796 square feet of residential space. The building would rise 158 feet into the air (below the height limit for the Special Downtown Brooklyn District) and consist of 47,618 gross square feet of total construction area, including a 29-space garage, presumably in the two-level cellar space. While the filing says nothing about affordable housing, the fact that the developers are planning to build to a floor area ratio of 12 – only possible with the inclusionary housing bonus – suggests that 20 percent of the units will be let at below-market rates. The developer, however, remains a bit of a mystery. Listed on the permit as Izzy Neiman, the person who answers the business phone number says they’re not affiliated with the project, and the business address – on the 10th floor of a Garment District loft building – appears to be shared by a men’s accessory manufacturer. This may or may not be the same project, but it seems to match. Different number of floors in the rendering compared to filed plans, so it may be a different project. Not sure. You got it right – there will be an update tomorrow on the site. Thank you for your photo updates! Awful. Rather see the old buildings, maybe even empty lots than these ugly cheap looking buildings they’re building in Brooklyn. Sad! A side effect of the boom. There are a lot of good towers rising, but not all of them are great. Some, like 215 Pearl, 8 Nevins, and 5 Beekman, are just horrendous. this is probably going to be the least attractive building in the current Brooklyn boom. This looks incomplete. Like a tower half way through the drafting process, and the drafter said f it and proceeded to smoke a bong. This has been rising recently. on your last photo, isnt that the site for that twisted stepped back morris adjmi building? maybe thats why they are emptying out the block?